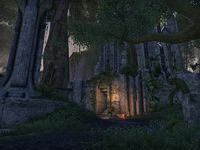 The name of these Ayleid ruins implies they were abandoned because of encroaching tree roots. But the Wood Elves whisper that the sundering roots were not those of normal Grahtwood trees. 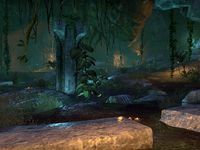 The Root Sunder Ruins are a set of Ayleid ruins between Elden Root and Haven in Grahtwood. Root Sunder Ruins Objective: Discover the fate of Root Sunder. 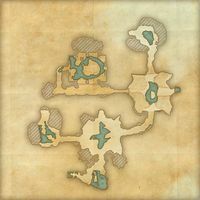 Forgotten Soul: Rescue a stranded researcher from deep within an ancient ruin. If the Dead Could Talk: Recover the journals of a research team from an overgrown ruin. Once "If the Dead Could Talk" is completed, creatures in the dungeon will be passive. This effect will end upon exit of the dungeon. Root Sunder Group Event 50 Destroy the Bonemonger and its captors in Root Sunder Ruins. 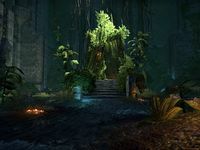 Root Sunder Vanquisher 10 Defeat three of the champions in Root Sunder Ruins. Root Sunder Conqueror 50 Defeat all of the champions in Root Sunder Ruins. This page was last modified on 19 November 2018, at 05:15.